The timing of when your baby's first tooth comes in can vary quite a bit. When your baby becomes a little fussy, drooling often and wanting to chew on things, your little one might be teething. But while those behaviors can be signs and symptoms of teething, they can very often occur without teething at around age 3 to 4 months. According to the American Academy of Pediatrics, "By age 3 or 4 months, infants are drooling and chewing on the things they put into their mouths. This is how they learn about the world around them." First-time parents might also be fooled if they see tiny white or whitish yellow dots on their baby's gums. Often mistaken for the first tooth, these are often instead gingival cysts. They can occur on the roof of an infant's mouth, where they are called Epstein's Pearls, and on the gums where they are called Bohn's nodules. And they go away without treatment. Although the average age for getting their first baby tooth is 6 months, some infants don't get their first tooth until they are 14 or 15 months old. Others can begin teething and get an early baby tooth at 3 months. 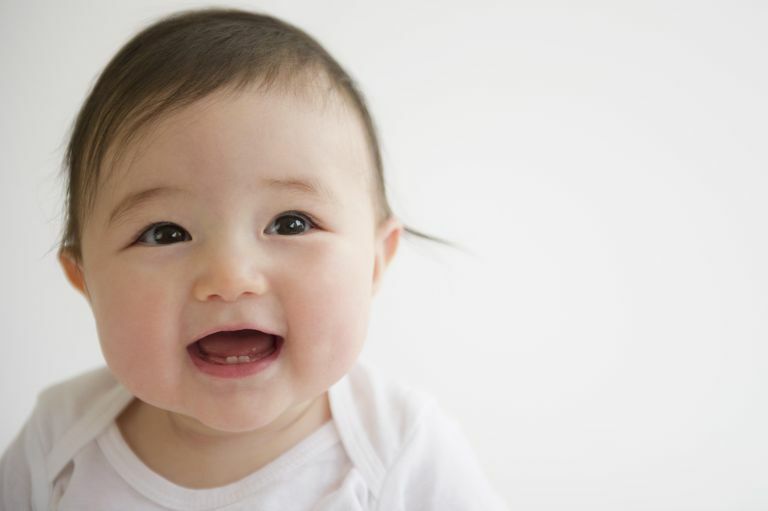 In fact, some babies can even be born with a tooth—a natal tooth—although these teeth often have to be removed. The timing of teething runs in the family, so if you or your parents teethed earlier or later, your own baby is likely to follow suit. When the teeth are ready to erupt, the lower, middle two teeth (central incisors) usually come in first, followed by the upper, middle two teeth. Some babies, however, don't follow this typical order or pattern and their teeth may come in randomly. While you should be wiping your baby's gums even before he gets his first tooth, you can start to brush his teeth with a smear of fluoride toothpaste as he gets them. The American Academy of Pediatric Dentistry recommends the first visit to a pediatric dentist within six months of getting the first tooth or by the time your baby is 12 months old. Proper oral hygiene translates to reduced risk for cavities, infection, or other oral health problems that make the normal challenges of teething progress that much more painfully. After the lower and upper middle two teeth, the lateral incisors, canine teeth, first, and then second molars all follow. Ultimately, your baby will get all 20 baby teeth (the primary teeth) by the time she is about 2 to 3 years old. You can then expect your child to start to lose her first baby tooth when she is about 6 years old. She will quickly start to get the first of her 32 permanent teeth at about the same time, although the last of the permanent teeth (the wisdom teeth) may not erupt until the high-school years. Kozuch, Mary. Infant Teething Information on the World Wide Web: Taking a Byte Out of the Search. Journal of Pediatric Health Care, Volume 29, Issue 1, January–February 2015, Pages 38-45.